Today only, those purchasing certain versions of the Surface Pro 4 and the Surface Book from the Microsoft Store, will receive a free Surface Dock valued at $199. The Dock features two Mini Display Ports, one Gigabit Ethernet port, four USB 3.0 ports and one Audio out port. The accessory is designed to work with Surface tablets. 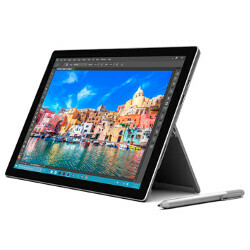 To be eligible for the free dock, you must buy the 256GB Surface Pro 4 powered by the Intel Core i7, and containing either 8GB of RAM ($1599) or 16GB of RAM ($1799). If the Surface Book is what you're looking for, the Dock is free when you buy the model with 256GB of storage, a Core i7 processor and 8GB of RAM ($2099). You will receive the Dock with a purchase of the Surface Book with 512GB of storage and 16GB of RAM ($2699). Also eligible for the free Dock is a purchase of the Surface Book with 1TB of storage, the Core i7 chip and 16GB of RAM ($3199). The deal is available in both the brick and mortar, and online Microsoft Store. As we said, the deal expires at the end of the day. If interested, click on the sourcelink. Good deal on already easy to justify products. The tablet laptop hybrid sure is, Docks are costly for no apparent reasons though. Not at free, they aren't. LOL, off course for free they aren't. The dock is no ripoff when you consider everything offers and compare it to the competition. Besides being proprietary and neat looking: - As it's pretty compact, it can double as a second/replacement charger with not just a meh 1 USB charging port (like on the charger that comes in the box) but 4 USB Charge AND Sync ports + multiple other ports, - It supports Mini DisplayPort daisy chaining, - Offers gigabit Ethernet port, - Offers an additional audio in/out jack, and - Simultaneously charges your Surface Pro/Book (you'll only dream of doing that over a regular USB port) All of the above is accomplished on one connection attempt, via 1 outlet like a regular charger, and should anyone trip over your cable, your device won't come flying off the desk as it's a magnetic connection. You could get a Pluggable docking station for half that price (or even less) and it'll offer way more ports PLUS it'll work with ANY PC that has a USB 3.0 port. However, no trip protection (off flys your device with he USB cable), won't be as cool/neat/portable (especially as you'll require both the dock and your separate charger), AND you'll have to be connecting/disconnecting at-least 2 cables; 1 for the USB 3.0 from the dock (which itself needs an outlet), 1 for supplying power to the Surface Pro (a second outlet), AND 1 for the Mini DisplayPort if you desire to use a Mini DisplayPort display or the daisy-chain function of Mini DisplayPorts. I was talking about docks in general. Ms take your overpriced device and shove it in the surface of your a*! I'm satisfied with my iPad and Chromebook.